I read and enjoyed Amanda Vickery's book The Gentleman's Daughter: Women's Lives in Georgian England, so I was really looking forward to getting my hands on her newest book, Behind Closed Doors: At Home in Georgian England. Vickery did so well in describing the lives of women, their roles in the home, in the village and in the city, that I was very excited to read more about their historical domicile, the house. But Behind Closed Doors is firmly not only about women, but also about the men. Vickery points out that we often associate the home with women, but that men were at home doing all sorts of things, too- they just wrote about it far less often than women did. Similar to her previous book, Vickery uses court records, letters, account books and many other primary sources to pull together her stories here. But, to me, the book felt less like a set of stories and more like a thesis that Vickery was trying to prove. 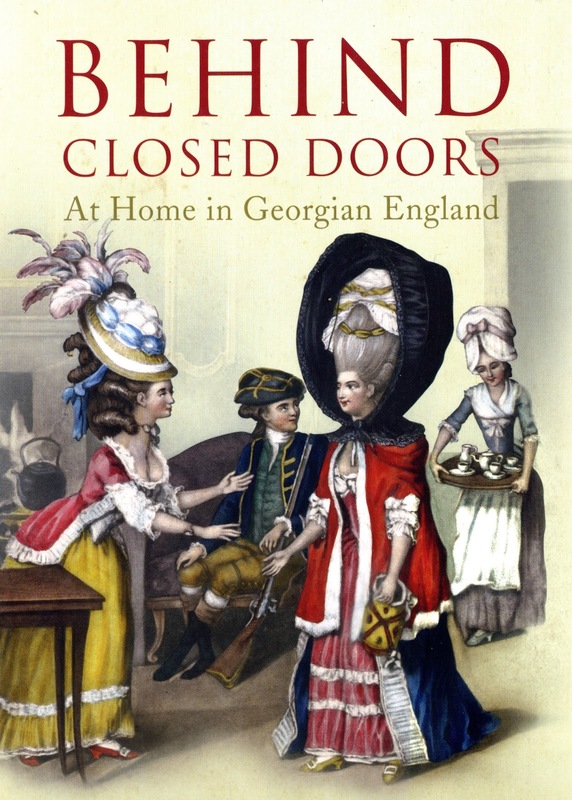 She seemed set in each chapter on proving something to her audience, and instead of a very interesting and detailed description of life in England during the "long 18th century," we get proof that women's taste was not historically "feminine" and that men really did respect women's opinions on things such as wallpaper and furniture. The result is a book that is full of interesting facts and fascinating characters, but is also drier and less engaging than its predecessor. Most people when they discuss this book talk about the fact that there is an entire chapter devoted to wallpaper. Vickery looks at wallpaper patterns to describe that elusive word, "taste," and describe the different tastes of men and women during the Georgian era. In many ways, this chapter is indicative of the book as a whole. It's interesting in that not many people are likely to have done so much research on wallpaper ever before, and I love that Vickery was able to glean so much information from pieces of fabric, and share with us some of the history around home decoration. But it's not exactly what I wanted because the people choosing the wallpaper, as introduced to readers through letters and bills and advertisements, don't quite come alive. I read this book to learn more about women's lives in the Georgian period, but the chapter I found most interesting was the one on bachelor living. Because Vickery is right- we really never do focus on what men's lives were like in the domestic sphere, and it's really fascinating. So many men just rented a bedroom and ate all their meals out. But then they couldn't bring anyone back to entertain at their own place. And, like so many college students, sometimes they just really craved a home-cooked meal and had to find a way to get one. What really floored me was just how much so many gentlemen wanted to be married. Vickery shows that in the Georgian era, marriage was considered a very masculine act that proved you could support a family and carry on your line. Unlike now, when it is often presented as being the end of a very exciting and invigorating single life. It was very nice to learn that men looked forward to marriage just as much as women did in prior eras. I also appreciated Vickery's comparison of women's lives - she details the sort of domestic life and trials that women could expect if they were married, if they were widowed, and if they stayed single and either had to earn their own incomes or depend on relatives. So many of these stories were sad and lonely, and I felt so deeply for the women whose voices came through in letters and diaries. But between these nuggets of gold, there was a lot of thesis-pushing. Vickery seemed determined to prove that women's tastes weren't so overtly feminine in the Georgian era, but that men and women generally appreciated the same style of things. While I think this is a very valid point, and one that companies should take note of as they continue to excessively genderize everything. But, that said... I wanted to read a book about private lives in Georgian England, not gendered tastes. It looks like Vickery made this book into a television series, and that television series is coming to PBS! So if you'd prefer the screen version to the book version, keep an eye out. I personally will be trying to find Vickery's podcast series, A History of Private Life. Based on the description, it looks like many of the stories are taken from Vickery's books, but the podcast seems much more focused on just how people lived their lives every day in the past. That's really what I wanted to see in this book, so I'm excited to see if the podcast can provide what I crave. This looks like just the type of book I'm itching for right now. Given my Outlander reading jag, I'm reminded of how much I like to be plucked out of my everyday life and set down somewhere else. The best historical novels, and the best non-fiction on a particular historical period are those that can introduce and explain the minutiae of life in the time period -- like wallpaper/taste. Will definitely look for this one or the other of her books you mentioned. Yes, I agree! And this book has a LOT of fascinating/bordering on tedious minutiae. I honestly think I'd be bored reading a whole chapter about wallpaper, though the premise for the book is interesting. I think most people would be bored by that ;-) I freely admit that it was not the most scintillating chapter I've ever read. There was some skimming done. I'd definitely check out the other book first- I enjoyed it much more. A whole section devoted to wallpaper? That is mystifyingly cool! It's too bad that certain sections were dry though. I might not have handled that well. I might be interested in flipping through this one at some point, and if it were ever a television series, I would totally watch it! Very fun review today! From my own experiences of thinking you're about to read one thing on history and finding another, I can understand how the proving thesis structure would be frustrating. It does seem to happen quite a lot, even if only confined to a chapter, and it really takes you out of the book. That said, a chapter on wallpaper sounds so mundane as to be very interesting! It sounds like it could be interesting in places but could I get through the boring parts? Hmm. Maybe I'll watch the series and look for that podcast! That's what I plan to do! The podcast sounds excellent! I am always on the hunt for good podcasts to listen to on the subway and the bus and other boring moments in my life. Bookmarking! I own both books now, and have bookmarks in both....but sadly not much into either. I really want to read them, my TBR mount is towering at this point. I saw a tv show done over in England with Amanda Vickery, on Behind Closed Doors. I didn't catch all the episodes - I saw 2 out the three episodes. They were interesting, but moved slowly, and I was wondering if the book followed it. I am going to be reading these! (some day!) thanks for the lovely review. It does sound interesting though! I was just considering to purchase either of the two, but your reviews (of The Gentleman's Daughter and this one) convinced me to go with the former. Thanks!